When we enter recovery and build a life for ourselves, we’re typically surrounded by others who are in recovery. The people we’re around understand that we don’t drink, we don’t go to the bars anymore, and we don’t associate with that life anymore. It can be even harder when you get sober in your 20s, we’ve entered the next stage of our lives, but there’s always some that don’t understand that means that we don’t drink, not even once in a while. It can be hard when we’re asked the dreaded question “Well why don’t you drink?” We don’t have to explain the long, harrowing tale of why we don’t drink, but it can often be uncomfortable for us to answer. There are plenty of ways to respond to the question of why we don’t drink. There are some situations that we can’t avoid alcohol coming up. Whether it be an invitation for after-work drinks, or at a family dinner, not everybody understands or knows that we’re in recovery. Here are some witty and easy responses to why you don’t drink. I’m allergic – if you work an AA program, then you’re familiar with the doctor’s opinion and that consuming alcohol causes an allergic reaction and triggers the phenomenon of craving within us. Knowing that it’s a sort of inside joke that you have with yourself. Food allergies can also have extremely adverse reactions if the food is consumed. Most people will leave you alone after you answer that you’re allergic to alcohol. If they continue to ask what happens if you drink, you can always follow it up with the famous Robert Downey Jr. quote “I break out in handcuffs,” if you’re comfortable enough with the person asking. I’m driving/I’m the DD – Unlike us in our drinking days, most DD’s are VERY stern with no drinking if they are driving. Many people will stop questioning you after you tell them that you are driving. The people you’re with will also be happy that they have someone who is a dedicated designated driver because that means they have a ride home after a night of drinking. I don’t like drinking – Some people genuinely do not enjoy drinking alcohol. That doesn’t mean that they don’t enjoy going to social gatherings, concerts, or out with friends. There are polite ways to decline a drink, they can keep you sober, and make it easier to say no. I don’t like the person I am when I drink – even “normal” people can be less than savory people when they drink. After a response like that, most people won’t question you further. They may even applaud your choice to no longer drink. No one wants to be with the person that causes a scene in public; this is an easy and honest answer to give someone. I’m in recovery – Depending on how comfortable you are or if you truly honor the anonymity side of the program, the full truth is always an option. If it’s a friend or someone that you’re comfortable disclosing that too, by all means, tell them. Even though addiction and alcoholism are highly stigmatized still, the people who matter will understand and will likely celebrate your sobriety with you. Even if they may not understand alcoholism or addiction, they won’t push the subject anymore. Stating that you are in recovery may open the door to some questions on their part, but it’s up to you how much you want to tell them! What if They Keep Asking Why You Don’t Drink? There are plenty of reasons why people will keep asking you “Why not just one drink?” “It can’t be that bad” or anything else they could say to try to coerce you into having ONE drink with them. Remember, you don’t have to explain yourself to anyone. There are ways to exit any conversation if they keep pushing tell them you’re not comfortable discussing this topic with them. If you feel uncomfortable explaining your sobriety to someone, you probably shouldn’t. You don’t owe anybody an explanation as to why you’re not drinking. When you disclose that you don’t drink at all, whatsoever, that tends to make people ask more questions that you don’t want to answer. People are naturally curious, but that doesn’t give them the right to harass you about your choices. Talk to your sponsor or share about it in a meeting after you’ve exited the situation. I guarantee that almost everyone else that is in sobriety has had an experience with the awkward position of the friend that doesn’t understand that you don’t drink at all, not even one. These are normal speedbumps that you may hit in your sobriety, remember that you always have your sober supports to turn to in times where you don’t know how to handle something. The real friendships we’ve gained in the fellowship are one of the biggest perks of sobriety, honest friendships. One of the other perks about living a life in sobriety is that we can save the money we used to spend at the bars! Remember if you are faced with this question often, you may consider changing the people that you associate with. 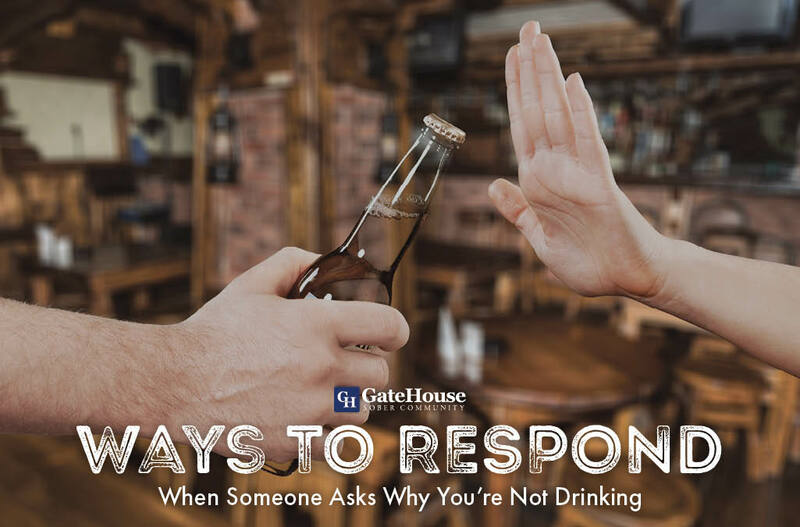 The questions about not drinking can be avoided if you tend to go out to events or gatherings with others who are in recovery. It can take one bad day to tempt during a hard time to have “just one drink.” Always put your sobriety first.